Blog Mixing and Matching Finishes – Fashion Faux Paus or Designer Secret? Mixing and Matching Finishes – Fashion Faux Paus or Designer Secret? The easy answer? Yes, you should mix and match finishes in your space. But does that answer give you what you need? Not really. Because once you have the answer to that question, a million more questions arise. Like, how often should I mix and match? In what rooms? When is it too much? What finishes can I mix and match, and which ones clash rather than complement? 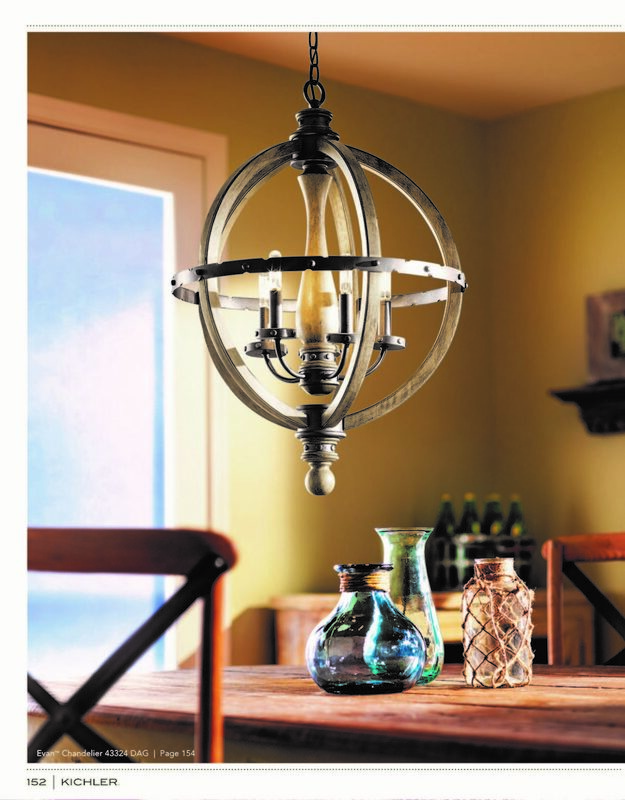 A good, and fairly fail-proof, way to mix and match finishes is to choose a lighting fixture that does it for you. Many lighting designers incorporate a couple of finishes into their fixtures to add some flair and dimension – the same thing you are hoping to do in your home. This is a good starting point because you allow the designer to select with finishes to pair together – now your job is just to carry it through the rest of your design (if you so desire). When you are mixing and matching finishes, don’t limit yourself to the lighting fixtures. There are many opportunities in every room to play with finishes, for example: door knobs, faucets, towel bars, mirrors, cabinet hardware, furniture arms and legs, and décor (and here your options are endless: soap dispensers, vases, trays, baskets, jars, canisters – you get the picture). In the kitchen picture below you can see there is variation in the light fixtures, using brushed bronze on the ceiling mounts and a brushed nickel on the island pendant; then the designer carried that finish variation through into the cabinet hardware, using the brushed bronze on the red cabinets and brushed nickel on the remaining. In the bathroom photo, you’ll see the designer chose a dark finish for the vanity fixture, and used nickel on the faucet, mirror, towel bar and cabinet hardware. I really like how the backsplash pulls all the color together in this space, while the soap dispense and counter canister draw the eye down from the light fixture to the sink area. These are really good examples of mixed finishes done correctly. And my last tip for you is to keep the number of finishes you use in one area to between two and four. Any less than two and your space may feel flat or bland, but any more than four and you’ll have too much chaos in your design, and you’ll risk losing a cohesive design. Hinkley’s dining room lighting below is a great example of mixed finishes throughout the space. The chandelier is dark, the wall sconce is gold, and the featured furniture is wood, then the table decorations and planted pots pull it all together by alluding to those various finishes in their color. Mixing and matching finishes is definitely a learned art. There’s a balance between matching finishes to create flow and synchrony, while mixing adds the character and boldness to create an interesting and appealing space. If you ever have questions or need a second set of eyes, the Lighting Gallery designers have wisdom to share. Good luck!